Lean forward. Place one hand on a table for support. The other arm can hang freely at your side. Swing your arm forwards and backwards gently. 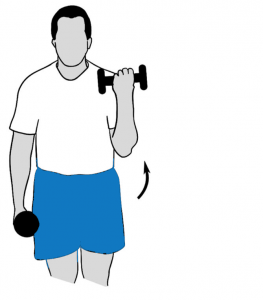 Repeat the exercise moving your arm side-to-side. Repeat the exercise in a circular motion. Using the other arm, repeat the entire sequence. Relax your shoulders. 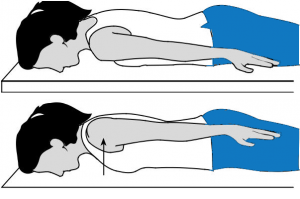 Pull one arm across your chest to the farthest possible, holding at your upper arm. Hold that stretch for 30 seconds. Then relax for 30 seconds. Similarly repeat with the other arm. With one hand hold a stick behind your back. Grasp the other end of the stick lightly with your other hand. 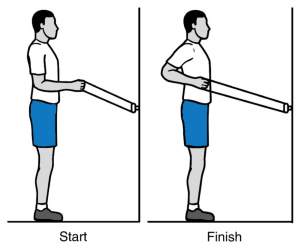 Pull the stick horizontally, so that your shoulder is stretched without much effort to the point of experiencing a pull without pain. Hold for 30 seconds. Then relax for 30 seconds. Grasp the stick with one hand. With the other hand, cup the other end of the stick. 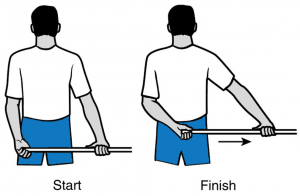 By keeping the elbow of the shoulder you are stretching against the side of your body, push the stick horizontally to the point of feeling a pull without pain. Hold this position for 30 seconds. Then relax for 30 seconds. Similarly repeat on the other side. 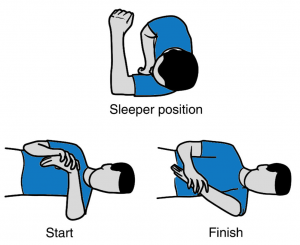 Lie on your side on a firm, flat surface with the affected shoulder under you and your arm bent, as in the picture. You can use a pillow under your head for comfort, if required. 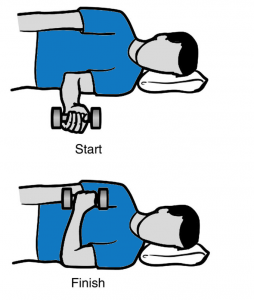 Use your unaffected arm and push your other arm down. You may stop pressing down, if you feel a stretch in the back of your affected shoulder. Hold this position for 30 seconds. Relax your arm for 30 seconds. Using an elastic band, make a 3-foot-long loop and tie the ends together. Put the loop on the doorknob or other stable object. 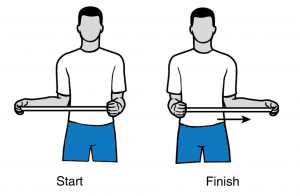 Hold the band with your elbow bent and at your side in the standing position as in the start position ( shown in the image). With arms close to your side, slowly pull your elbow straight back. Return to the start position slowly and repeat. 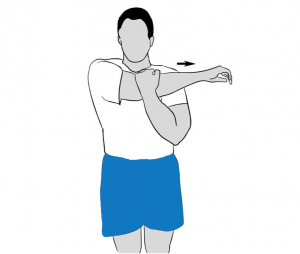 Hold the band with your elbow bent at 90° and raised to shoulder-height, as shown in the start position. Keeping your shoulder at elbow level, gradually raise your hand, in line with your head. 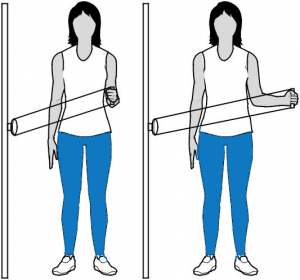 In standing position, hold the band with your elbow bent and at your side, similar to the start position in the image. With your elbow close to your side, bring your arm across your body. Now gradually return to the start position and repeat. Stand Straight with your weight evenly distributed over both feet. Keeping your elbow close to your side, gradually bring the weight up toward your shoulder as shown. Hold that position for 2 seconds. Gradually return to the starting position and repeat. Raise your arm and bend your elbow with the weight behind your head. 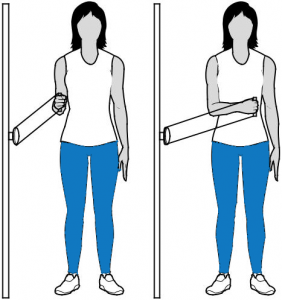 While raising your elbow support your arm by placing your other hand on your upper arm. 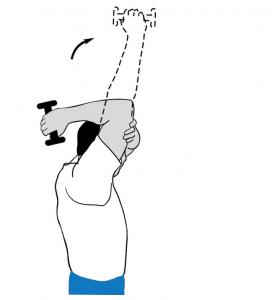 Gradually straighten your elbow and bring the weight overhead. Hold for 2 seconds. Slowly bring your arm back down behind your head and repeat. Place your knee on a bench or chair and support your weight by leaning forward so that your hand helps support your weight. With your other hand at your side, palm facing your body. Slowly lift your arm, rotating your hand to the thumbs-up position to the shoulder level and with your arm parallel to the floor. Slowly lower your arm to the original position, for 10 seconds. Lie on your stomach, with your arms by your sides. If required, you can place a pillow under your forehead for comfort. Gently draw your shoulders together and down your back as far as possible. Ease halfway from this position and hold for 10 seconds. 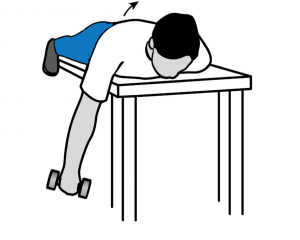 Lie flat on your stomach on a table or bed. Hang your injured arm over the side. Keep your elbow straight and lift the weight gradually by squeezing your shoulder blade toward the opposite side to the extent possible. Keep your arm straight and slowly raise it to your eye level. Extend your arm straight out from the shoulder and bend the elbow 90° as in the image, so that your fingers are pointed up. 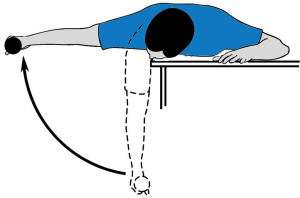 With your elbow bent and on the floor, gradually raise your arm, as in the arc direction. Bring your elbow down to a 45° angle, if it painful at 90°. 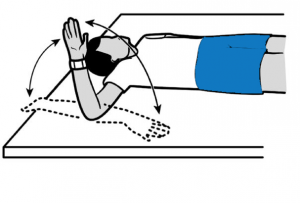 Lie on your side on a firm, flat surface with your unaffected arm under your head. Keep your injured arm on your side, with your elbow bent at a 90° angle. 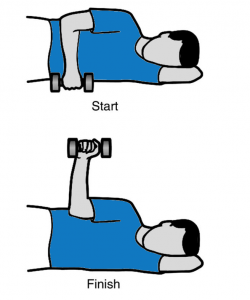 With your elbow against your side, gradually rotate your arm at the shoulder, raising the weight to a vertical position. Gradually lower the weight to the start position to a count of 10. Lie on a firm, flat surface on the side of your affected arm. Placing a pillow or folded cloth under your head, keeps your spine straight. Hold your injured arm against your side as shown, with your elbow bent at 90° angle.